JF: "Excellent depiction of the WT101 rye flavor profe. I'm a huge fan of the WT line and the Russell family's distilling work. A rye that they do which is superb for drinking neat is Russell Reserve Rye 6. I gave it five stars. Have you tried it?" Sku: "Josh, I reviewed Russell's Rye back when it first came out. My thoughts then was that it was nice enough but a bit soft for my taste. Overall, I prefer the 101." Color me mystified and impressed. WT 101 Rye runs just over half the price of Russell's Reserve 6. If it was better it was a serious bargain. 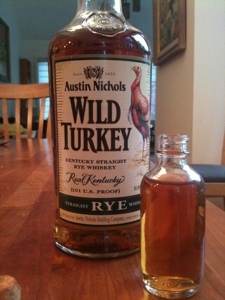 Certainly the term "bargain" often attaches well to Wild Turkey's affordable and excellent whiskies. I had to try it. Despite the reports of scarcity I located WT 101 Rye at several NYC liquor stores including Shopper's Vineyard ($22) and Park Avenue Liquors. Nose: Hot spirity Bourbony with a big slap of sharp varnish and acetone. Rich with floral peach, toffee, leather and oak. The entry is intensely sweet and minty with a gentle but firm expansion at mid-palate of peppery herbal kick. The mid-palate ranges over the familiar rye flavor elements: big alfalfa sweetness with a roundness that eloquently speaks to a good measure of corn in the mash bill, effervescent spicy fizz buzz, and herbal parsley and ivy flavors which hand off to assertive char and oak at the finish which ends on a bittersweet and herbal bitters flavored note. The bitterness is a tad much - my primary issue with WT Rye 101. But it's a quibble. This is a lovely rye - well situated between the gentle mineral, floral and lanolin of the Russell's Reserve Rye 6 and the bigger kick of the sherry-cherry salt bang of Rittenhouse Rye 100 and the intense herbal pow of Old Potrero Single Malt Rye. This is a big sweet farm harvest of a rye: bold, spicy, herbal, and sugared. Another inexpensive classic from the Russell team at Wild Turkey. Bottom line, however, I still find that Russell's Reserve Rye 6 strikes the best balance between peppery kick, and herbal floral sweetness. It has a lush beauty in its gentle aspect that seduces me completely. Maybe my recent bottle is an improved version over the 2009 first edition Sku reviewed - or maybe just a difference in taste. In recent experiments with what I consider the king of American cocktails, the Manhattan, I find that each of these excellent ryes makes great Manhattans, but with strikingly different flavor profiles. Russell's Reserve Rye is particularly synergistic with orange bitters and sweet vermouth. 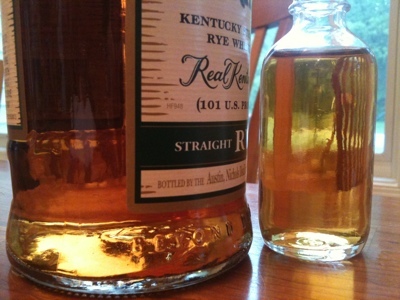 WT 101 Rye is a versatile player that mated excellently with all bitters and both sweet and dry. Easy to recommend, easy to afford, and, for the moment at least, still fairly easy to find. Sadly I haven't been able to warm up to RR rye on its own. I found it to be a little bit thin in comparison to its competition, though that's a problem that can be fairly easily solved with a little bit of Demerara rum. However it sounds like WT 101 might be a bit more to my taste. Pretty much exactly what Sku said. RR is a bunch of subtle flavors. I find it takes a lot of time to bloom in the glass when drinking it neat. I don't mind waiting. In a Manhattan it's less assertive, but I like the way it plays with citrus. WT101 is a much clearer more assertive flavor. The bitter notes in WT101 rye go very well in a Manhattan. Rittenhouse 100 is even bigger - but I find it gets a bit intense in a Manhattan for my taste (until the ice does its thing).